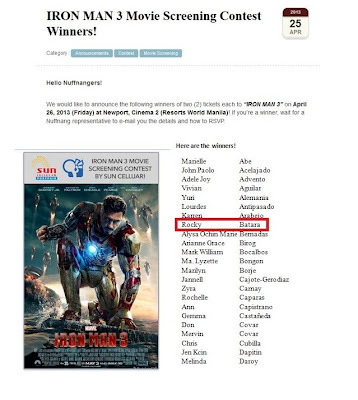 Home Hollywood Movie Iron Man Iron Man 3 movie Movie Premiere Movie Screening Nuffnang Superhero 'Iron Man 3:' Another Winning Experience! I won another new movie screening! This time, it's for the Marvel box-office flick "Iron Man 3." And yes, I was able to watch it together with my friend in New Port Cinema 2 in Resorts World, the same venue where we watched last year's "Twilight Saga: Breaking Dawn." The third series of this superhero movie is the best among its previous two versions. It's more hi-tech and more breath-taking! I wouldn't talk too much about this movie for the meantime since many requested to avoid spoiler. But definitely, you will enjoy this film the way we did! And I proved why it was hailed as this year's first-day highest grossing foreign film.